Pomaika'i Keawe and sons Arthur, Gary and Eric. For the inaugural offering of its third season of "Na Mele: Traditions in Hawaiian Song," Hawaii Public Television starts off with a bang, and it's a bang that extends across several generations. 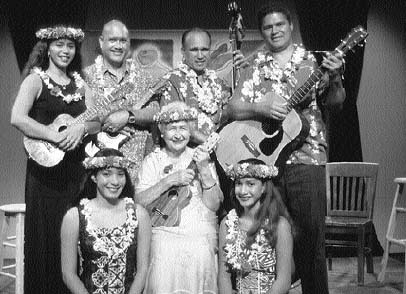 Aunty Genoa Keawe, now 82 but with a falsetto that won't quit, is showcased on the popular music series, accompanied by, among others, her sons and granddaughters. The Keawe matriarch, who by the way is a recent recipient of a National Heritage Fellowship from the National Endowment for the Arts, opens the program with a vocal trip down memory lane, singing a medley of "Kuwili," "Ahuli'i" and "Hula O Makee." But later numbers feature future torchbearers of the Keawe musical tradition. Pomaika'i Keawe, in particular, sings with a voice that is unmistakably similar to her grandmother's, yet has a personality all its own. The family affair airs at 7:30 tonight and 10:30 p.m. Sunday on KHET/PBS. Kahoano. During its eight-year run, "Hawaii Stars" has made stage dreams come true for hundreds of budding entertainers. Festival of jazz bands: 10 a.m. to 4 p.m. Top high school and collegiate jazz bands perform in a showcase presented by the Oahu Band Directors Association. Spring is in Fashion Show: 6 to 7 p.m. KITV's Pamela Young and Gary Sprinkle emcee a show featuring fashions from Cache, Celine, Ethel'ßs, Liquid Aloha, Loewe, Pacific Harley Davidson, White House/Black Market, Sephora and Tapestries by Hauoli, with makeup by Sephora, featuring the Body & Soul Collection, and hairstyles by Salon 808. Spring Hair Fling: Noon to 1:30 p.m. How high can they go? Through the magic of hairspray and found objects, students of HCC's School of Cosmetology will stage a big hair demonstration and show some wearable styles on the heads of some of Hawaii's beauty queens.